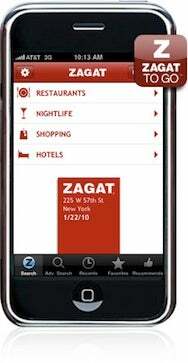 Zagat, publisher of the popular restaurant guides, has released Zagat To Go 3.0, the latest version of its iPhone app. Zagat now includes augmented reality, which provides an interactive view of restaurants in your immediate vicinity. The app has also added offline sync, allowing you to access Zagat content without Wi-Fi or mobile reception. The Zagat Survey, which has been around since 1979, offers collective wisdom about restaurants and lets diners contribute to its surveys. The company currently covers 70 cities, and has compiled data from hundreds of thousands of patrons. Zagat is now adding reviews of hotels, shops, and local nightlife. Zagat To Go lets you search for nearby establishments using the iPhone’s GPS, look up ratings, and write reviews of your own. The new augmented reality merges the camera's view of a restaurant with additional information about the place. In addition to offline sync, version 3.0 also includes a “digital concierge” feature that filters restaurants based on your preferences and lets you make reservations. Zagat’s restaurant review offering comes hot on the heels of Yelp 4, a popular iPhone app that also includes an augmented reality feature. But Yelp is free, unlike Zagat’s app, which costs $10 for a year's subscription. Zagat is clearly hoping that users will pay a premium, year after year, for its brand and for the well-established content. Zagat To Go 3.0 is available now in the App Store. It’s free to those who’ve purchased the previous version and works on any iPhone or iPod Touch running iPhone OS 3.1 or later. To use the augmented reality feature, you’ll need the iPhone 3GS.